The Distributor Event was over a three-day period, with a Welcome Reception and Registration on the first evening, a full-day conference for the second day and entertainment in the evening, training sessions, an Equipment Expo and facility tour on the third day. During the full day conference, attendees received business and departmental updates, which included an overview of advancements, latest innovations and new distributor tools. The afternoon was dedicated to Product Innovation and sharing Product Roadmaps – with breakout sessions led by Product Managers Ed Sauser, Chris Reed and Wayne VanAntwerpen – to inform distributors of the Canica, Cedarapids and Simplicity Modular, Portable and Static Strategy product innovations up until 2020. In the evening, the distributors and Terex MPS Team Members celebrated and relaxed with Jazz Fun – jazz music and great food. The morning of day three focused on the progress made on the Terex MPS Training Academy, in particular the E-Learning platform and Sales Training modules. Product Managers undertook three new sales training sessions. 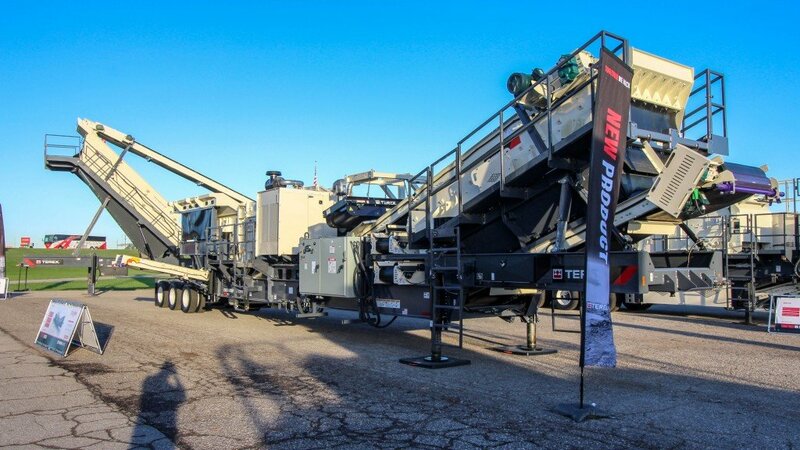 The afternoon saw an Equipment Expo, which showcased the latest Terex MPS innovations, including a demonstration of the Common Control Module with a three-machine setup, and the new CRH1111R. The CRH1111R plant is a result of distributor and customer surveys which requested improved transportability, larger screen capacity, and lower-maintenance electric components compared to other equipment in this class. The plant is smaller and more transportable with its three-axle suspension compared to the longer, heavier, four-axle CRH1313R plant. This new plant features the TI4143 impact crusher and a 5x16 two-deck inclined screen. The crusher is hydraulic clutch driven direct from a 350hp Scania diesel. All other components are electric driven from the 150kw generator. With its large screen, wide conveyors, and low-maintenance electric-driven components, this is a highly productive, high-value plant. In total, 10 machines were displayed, demonstrating the breadth of the product portfolio, the brands, and the modular, portable and static strategy. By each machine was an equipment specialist, who spent time delivering the unique selling points of each machine to the distributors. Finally, the Expo included a Wear Parts Display, overseen by Troy Hartman, business development manager, Wear Parts – MP. David Quail, business line director for the Americas & Australia said, "Our Americas Distributor Conference and Equipment Expo was an important event to engage with our distributors, to talk, listen and understand each other, and ultimately drive our shared businesses forward together. We had a full team of Marketing, Sales, Aftermarket, Technical and Engineering staff on hand throughout the event to facilitate this. Our distributor network is without doubt one of our strongest assets. It is important for us to share with them our passion and knowledge for our products."